Mix the marinade ingredients together. Add the marinade to your chicken, then add your cornflour, massage well and set aside for approximately 15 minutes. 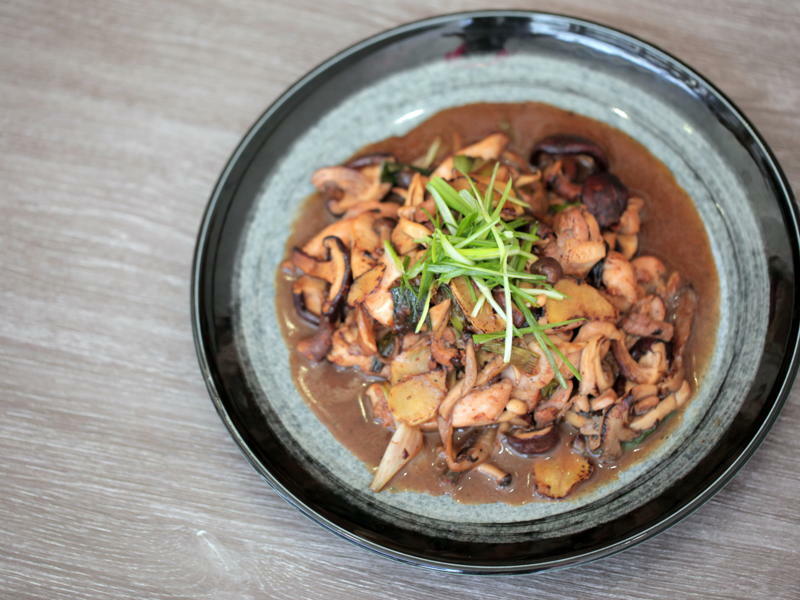 Slice your mushrooms, chop your ginger and spring onion. Mix up your sauce ingredients and set aside. Flash fry your mushrooms using a bit of oil. Cook your mushrooms until they are slightly charred, then add a splash of water into your wok to help them cook through. Don’t overcook your mushrooms and take them straight out of the wok and set aside. Add more oil to your wok. Add your ginger and spring onion. Fold through and sear to give it time to flavour the wok. Push your ingredients to the side, add the chicken and sear the chicken. Bring the ginger and onion on top of your chicken so it doesn’t burn. Repeat the process several times. Bring the wok to high heat, add the mushrooms to the chicken and add the sauce. Give a couple of wok tosses and cook for 2-3 minutes. Serve with a garnish of finely sliced spring onion.